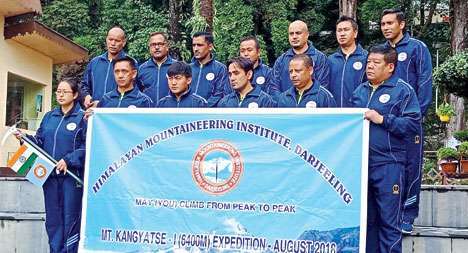 Darjeeling: The Himalayan Mountaineering Institute here has flagged off its first ever Alpine style expedition - where no Sherpa guides and porters or external help will be sought beyond the base camp - to Mt Kang Yatse (21,031ft) in Ladakh. Sayeed Ahmed Baba, the principal secretary of the Bengal youth services and sports department, flagged off the expedition team on Saturday. The 19-member team led by Wing Cdr. Devidutta Panda, the vice-principal of the HMI, will itself take the responsibility of all mountaineering tools, opening routes and cooking among others during the climb. "We decided to conduct an Alpine style expedition with the instructors of the institution for a first-hand experience. In the Alpine style expedition, no external help is sought either from Sherpas, porters or any other source. Our instructors can try out different climbing techniques and modify styles," said Panda. In mountaineering parlance, Sherpa denotes "mountain guide" and it is largely believed without them, scaling high altitude peaks is much more difficult. The 19-member team includes female instructor Nima Lhamu Lepcha and curator C.N. Das among others. During the monsoon, the HMI does not conduct any courses and tries to make best use of the opportunity to provide first-hand experience to the instructors. "We have decided to climb a peak in Ladakh (Markha valley) as it does not rain there during the monsoon," said Panda. Success rate in the Alpine style expedition is relatively less as climbers don't avail themselves of outside help. But the team of experienced instructors from the premier mountaineering institution in India is confident of success. The HMI will form two teams comprising nine members each. The groups will try to criss-cross each other and climb both Kang Yatse I and Kang-Yatse II peaks, which are separated by a rocky ridge. The 29-day expedition will start on August 1 but a four-member advance team will leave for Leh on July 25. "We are looking at scaling the twin peaks on August 15," said Panda. The Himalayan Mountaineering Institute here has flagged off its first ever Alpine style expedition - where no Sherpa guides and porters or external help will be sought beyond the base camp - to Mt Kang Yatse (21,031ft) in Ladakh.